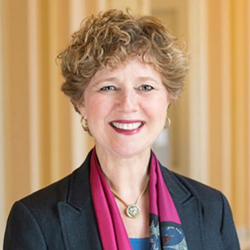 Congresswoman Susan W. Brooks represents the Fifth District of Indiana and uses her background as a former Deputy Mayor of Indianapolis and U.S. Attorney to improve jobs, health and homeland security. She serves on the House Energy and Commerce Committee where she focuses on mental health, substance abuse, biodefense and telecommunications issues. She is a member of the Health, the Communications and Technology, and the Oversight and Investigations subcommittees.